When we moved into our new house recently, I was faced with the challenge of finding a way to keep all of these hardwood floors as beautiful and clean as they were the day we moved in. I have to be honest. We had hardwood floor in the kitchen and dining room of our old house, and we did not do a good job with those floors. We used harsh floor cleaners and waxy polishes, without thinking twice. After the first year, they never looked good again. 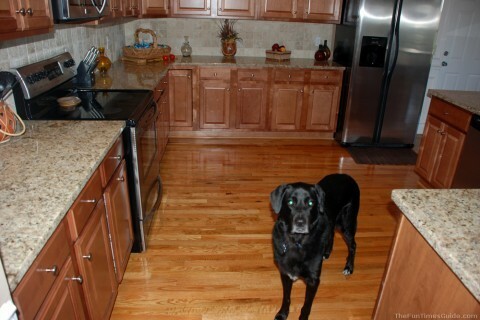 They were also a softer oak floor (not laminate though), and we raised 3 dogs on those floors. So, you can imagine what they looked like when we moved out after 8 years! That’s exactly why I vowed to take extra special care of our new hardwood floors. I was only going to use “the best” cleaning products on them, and I would try to keep the dog running in the house to a minimum — in order to prevent dog claw marks. To start with, I had to find the best way to clean these amazing looking hardwood floors that we have. So I asked around. First, I asked a General Contractor friend of ours, and then a few store clerks here and there. But no one had a definitive answer for me regarding how to safely and effectively clean hardwood floors. I decided to go to a local hardwood flooring store and ask for their opinion. Going in, I knew that I would take their advice with a grain of salt, because I figured they would try to sell me whatever hardwood floor cleaner they sold. (And they did try.) But I’m the world’s biggest skeptic, and I have to do some research and see for myself before I’ll try anything new. I spoke with a sales rep at the hardwood flooring store who also happened to have 3 dogs (I liked that she and I had that in common), and the entire first floor of her home consisted of hardwood flooring (like mine). Fortunately or unfortunately, she only had one product to recommend. And that was (obviously) a product that they sold: Bona hardwood floor cleaner. But I tried to keep an open mind. If it’s truly the best hardwood floor cleaner, then that’s probably why they only sell it, rather than selling a number of different hardwood floor cleaners, right? It won’t dull your floors. It doesn’t leave any residue. It’s the best and safest cleaner for your hardwood floors. Then I mentioned to her my desire to have a spray mop or steam mop do most of the work for me, rather than having to spray this Bona cleaner on the spots as needed — followed by mopping the floor with a soft cloth (or a dry mop with a soft cloth placed on the head). She mentioned that Bona also sells a floor dusting pad (similar to the Swiffer dry mop), but she honestly felt that you didn’t need to buy that to do the job. She said that simply using a soft cloth would suffice. And if I already had a dry Swiffer-type mop with a soft cloth placed on the head, that would work too. I had a Swiffer dry mop, so I decided to buy a small bottle of the Bona hardwood floor cleaner and try that with my Swiffer. I placed a soft microfiber cloth over the Swiffer’s mop head. From the first time I tried the Bona dry mop & hardwood floor cleaner, I loved it! It truly picked up dirt, mud (paw prints after playing in a muddy yard) and dust better than my Swiffer dry mop alone. The Bona dry mop also didn’t smear the dirt and mud on the floor, it dried really quickly, and it left no streaking whatsoever. So that was my method of cleaning hardwood floors for several weeks. Eventually, my arm began to tire of this 2-step process: spray the spots on the floor that needed cleaning, and then use the lightweight Swiffer dry mop to “scrub” the dirt away. The biggest problem is the fact that the pole of the original Swiffer mop is not heavy-duty enough to withstand the pressure needed to wipe away anything other than light dust. For muddy spots, I like to give it a little extra elbow grease, and the Swiffer dry mop simply doesn’t work well for that. So I began my search for a spray mop type of contraption. I knew that Bona had their own dry mop that might possibly be better than Swiffer’s lightweight one, but that would be my last resort. What I really wanted was an all-in-one unit that would hold the liquid, do the spraying, and do the mopping — all at one time. First, I tried the ever-popular Shark steam mop. The one I got was the newest, steam pocket mop. I really liked the concept, and was thrilled to have found an all-in-one unit. Unfortunately, the results were dismal the very first time I used it. It left streaks all over my hardwood floors! Keep in mind, with the Shark you don’t use “cleaners” per se, you simply use water. The water heats up inside and you pump it a few times to create the steam, while mopping your floors at the same time. I also wasn’t crazy about the fact that I had a long electrical cord (that I could trip on) following me around as I cleaned the floors. And the Shark steam mop was kind of heavy too. Overall, it seemed bulky and awkward to me. Those things were not deal-breakers for me though. The deal-breaker was simply the fact that I couldn’t live with all the streaks left behind after using the Shark steam mop. And this was when I used a brand new mop pad (the one that comes with the mop). After seeing how well the Bona hardwood floor cleaner alone had truly “cleaned” my hardwood floors and left no streaks, I came to the conclusion that water alone (or steam) probably just won’t cut it. I need a more effective method for cleaning the floors. Quite by accident, I noticed that a brand new Bona spray mop was available. The Bona Spray mop was the answer to my prayers! I don’t know if they claim that it’s ergonomic, or if you could even build a mop that is ergonomic, but I feel like this mop is ergonomic. Meaning, it just feels comfortable in my hand — from the spray trigger to the shape of the handle, it’s a natural fit. It’s very lightweight (3.1 lbs) — even with a full cartridge of Bona hardwood floor cleaner (2 lbs) in it. My arm never gets tired, like it does when I’m using the Swiffer dry mop for dusting the hardwood floors before each cleaning. It’s incredibly sturdy. Nothing bends or “gives”, nothing cracks or creaks. The entire thing seems solidly built. This allows you to give the really dirty spots a little more elbow grease, without it feeling flimsy. The Bona cleaning pad itself isn’t thick and plush, like you might think (and like the Shark steam mop pad is). Instead, it consists of very thin, tightly-weaved fibers, more like a terry-cloth pad, which I like because it seems to work better. 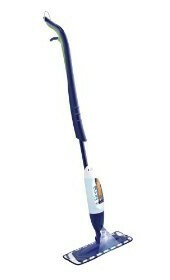 The way the cleaning pad attaches to the Bona spray mop is much better than the way the Shark steam mop pad attaches. The Bona one stays firmly in place thanks to a long thin pieces of velcro. Whereas, the Shark’s pad moves around loosely on the mop head. The width of the mop head itself is 10 inches, which without a doubt covers the widest surface of any wet or dry mops I’ve ever seen. This makes it easier to clean your entire hardwood floor (or to simply spot-clean) with fewer strokes required to get the job done. The mop pads are washable and reusable (as are the Shark’s). I recommend buying an extra cleaning pad, so you can have one in the laundry and still be able to clean your floors. You simply pull the spray trigger on the mop once and a fine mist of the Bona hardwood floor cleaner shoots out of the middle of the pole (at floor level) and covers a 180-degree range — to the left, to the right, and straight ahead. You don’t have to keep “pumping” the mop (or the handle of the mop) to get the liquid to dispense, like you have to do with the Shark steam mop to get the steam to come out. Each squirt seems like just the right amount, so it wipes up with one swipe of the mop pad. And each squirt is barely more than a fine mist, so it doesn’t seep into your floor boards. The floors dry really fast. You do have to wait a minute or two for the floors to dry — otherwise, your feet will sort of stick to the floor and leave marks where you’ve just cleaned. But once it’s dry, there’s no tackiness, film, or residue at all. There is absolutely no streaking whatsoever. I was particularly afraid that it would be noticeable where I spot-cleaned, and where I didn’t. But it’s not evident at all where you started and stopped. Each cartridge of liquid cleaner seems to last a long time. With a dog, and a backyard that has lots of muddy spots, I’ve been using Bona spray mop a lot. My first cartridge (before refilling it) lasted about 2 months of regular spot cleaning. The price is quite reasonable! At $39, the Bona spray mop is much cheaper than the $119 Shark steam mop. Yes, The Liquid Cleaner Cartridges Are Refillable! On first glance it appears that the cartridges of liquid Bona hardwood floor cleaner that work with the Bona spray mop are not refillable. But that’s not true! Yes, they want you to believe that — so you’ll buy more of the expensive refill cartridges again and again. And yes, they make it difficult to refill them (you have to use a screwdriver and a little bit of muscle). And yes, they only market the Bona spray mop as having “replaceable” cleaner cartridges, not refillable ones. But this reminded me of all the other non-refillable products that manufacturers “trick” you into thinking they are refillable (like the Pledge Fabric Sweeper For Pet Hair), and there is almost always a way to make them reusable and/or refillable. So I knew there had to be a way to make these cartridges refillable. Simply use a medium-sized flat head screwdriver to pry the lid off of the top of the cartridge itself. Try not to nick or bend the plastic too much, or it could cause the cartridge to start leaking. Refill the cartridge using a gallon-sized refill of Bona hardwood floor cleaner and a funnel. UPDATE: They’re now making “official” Bona REFILLABLE cartridges with easily removable lids! (Finally.) Since they’re still trying to get rid of all the non-refillable ones on store shelves, be sure you look for the “refillable” label on the cartridge itself. I got my Bona spray mop at Bed, Bath & Beyond using one of their 20% off coupons. I used another 20% off coupon to buy another Bona microfiber cleaning pad. And another 20% off coupon to buy a gallon refill of the Bona hardwood floor cleaner. I recently saw 1-gallon refills of the Bona hardwood floor cleaner at Costco for a really good price. I think it was even less than the price you’d get if using a coupon at Bed, Bath & Beyond. Ditto for the price at Home Depot. And, of course, you can find all of the Bona hardwood floor products at Amazon, as well. Whether you buy on Amazon or not, I encourage you to take the time to read the reviews of all the different Bona hardwood floor products there. Those are from people who’ve actually used the product. I find a lot of helpful tips there. UPDATE: #1: For added shine (similar to a wax), I was excited to try the Bona Hardwood Floor Refresher on my floors. It prolongs the shine on your hardwood floors and protects them better than the Bona cleaner alone does. Here’s a video that describes the Bona Refresher. Here’s my review of the Bona Refresher. UPDATE #2: After years of using the ‘regular’ Bona spray mop to clean my hardwood floors, I eventually tried the Bona Motion mop with sonic cleaning power (a.k.a. vibrating motion / very light agitating motion). Here’s my review of the Bona Motion mop. UPDATE #3: Eventually, curiosity got the best of me and I reluctantly tried a steam cleaner on my hardwood floors — just once. Here’s my review and what you need to know about steam cleaning hardwood floors!